ALBERT HENRY KREHBIEL (1873-1945) (link) is an American artist known for his paintings of Chicago cityscapes, the rural Midwest, and brightly colored Santa Fe and Santa Monica landscapes. He studied at both the School of the Art Institute of Chicago and the Académie Julian in Paris where he received artistic acclaim and recognition. 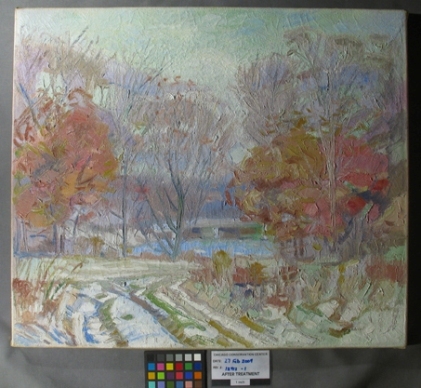 As a faculty member of the Art Institute of Chicago, he helped start the Chicago Art Institute Summer School of Painting (Ox-Bow), and also was a faculty member of the Illinois Institute of Technology. His paintings are located in many collections, including those of the Smithsonian Institution and the Art Institute of Chicago. When dealing with condition issues such as flaking paint, it is important to address conservation treatment as early as possible to prevent further paint loss and structural damage. Stabilizing the paint layer and structural instabilities ensures that the integrity of the artwork will be protected from future deterioration, and allow future generations to enjoy Albert Krehbiel’s artistic message. BEVA 371: A non-aqueous heat seal adhesive developed by Gustav A. Berger of New York which is widely used for the lining of oil paintings, heat seal facings and the making of laminates with fiberglass, etc. Friable: Easily crumbled or broken; brittle. Gamblin Paints: A brand name for conservation paints that are stable, reversible and used in a wide array of painting styles and techniques. They are made with a low molecular weight resin binder making them safer to use. Modostuc: A brand name for the white paste used as fill material. It dries quickly to a hard smooth fill, and can be sanded and painted making it appropriate for filling losses during treatments.